Iva Zimova photographer | The greatest WordPress.com site in all the land! Protests against the regime of Syrian president, Bashar Assad, erupted in March 201. Demonstrates in Damascus and the southern city of Deraa demand the release of political prisoners. Although initially peaceful, security forces shoot a number of people dead in Deraa, triggering days of violent unrest that steadily spread nationwide over the following months. In response to being ordered to shoot unarmed civilians, large numbers of soldiers and police deserted and formed the core of the Free Syrian Army (FSA), which was soon joined by civilian volunteers. Since early 2012 the protest movement has escalated into an armed uprising that many consider to have become a civil war. Whichever side civilians support, they have long borne the brunt of a conflict they did not choose and that no-one seems capable of stopping. Hundreds of thousands have fled the country, creating large refugee populations in Turkey, Jordan and Lebanon. Those who have stayed have no food, no water, no electricity. Sanitation systems have broken down and piles and piles of uncollected waste lying everywhere.Diseases are spreading among people whose immune systems have been weakened by hunger. Tuberculosis is ravaging some neighbourhoods, and there have been hundreds of cases of leishmaniasis, a skin disease transmitted by sand flies. Factories and businesses have ground to a halt. Jobs are almost nonexistent. Fresh meat and groceries are available, but prices have inflated so much that is beyond the means of people who have not worked for such a long period. People’s savings are exhausted and whatever they could sell is sold. In Syria today, there are no easy solutions. On one hand, the regime can no longer hold its control on northern cities, while on the other hand, rebel fighters are still not fit to provide the population with their basic needs. War profiteers have made the situation even worse. The long-term psychological damage on an entire generation of Syrians has yet to be played out. If there is no immediate action the world will watch a horrifying humanitarian crisis in one of the oldest civilizations. I first developed my photographic eye in Montreal, where I studied photography at Dawson College. But Dawson Collage teaches commercial photography, and in any case I found that I was more comfortable wandering the streets with my camera than being locked up in a studio. Montreal’s streets were not enough for me, however, so I started to travel to different places. 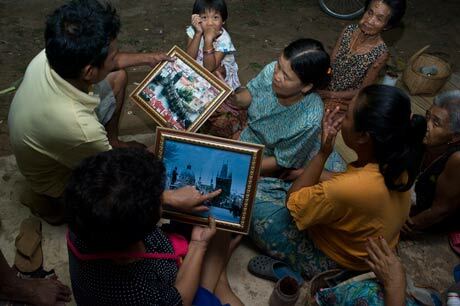 I became resolved to document the lives of people who are persecuted or neglected. In 1998, during the war in Kosovo, I encountered the Czech NGO, People in Need, and since then I have contributed to their efforts with my work. It’s very important for me to be involved in the environment that I am photographing. To be accepted by the people I photograph and to become one of them is a part of what I do. This takes time, but it allows me to be a privileged witness of social occasions and rituals that would otherwise be off-limits: births, baptisms, spiritual ceremonies, weddings and funerals. I always carry my cameras (one digital and one film camera) with me in my backpack. The pack becomes a part of my body and if I don’t have it on me, I feel like I’m missing something. To have my cameras with me at all times gives me the opportunity to photograph anything that I find interesting, at anytime. I am representing by Panos Pictures. All my friends went back to Bangkok and then home – all the farangs (Thai word for someone of European ancestry, no matter where they may come from) – except for me. 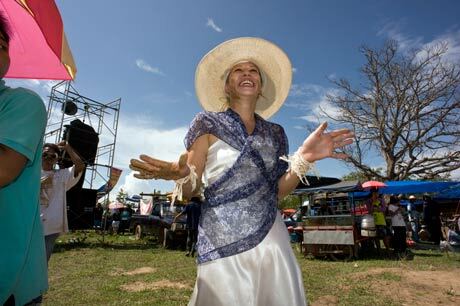 I stayed in the village of Nong Diang Noi Non Yai, the village where the wedding was celebrated. I stayed with the groom’s family. There were six of us; aunt and uncle, their two daughters, one still a schoolgirl, the second married, her husband, and I. Everybody only spoke to me in Thai, not realizing I do not speak it. I spoke to them in English, realizing they do not speak it. 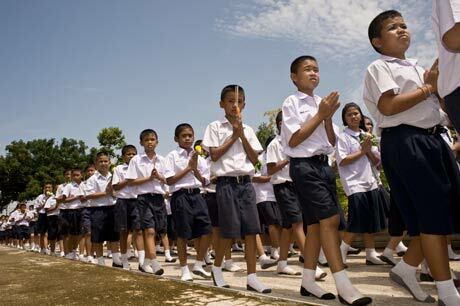 Nong Diang Noi Non Yai village is near the town of Kantharalak, in Isaan province. 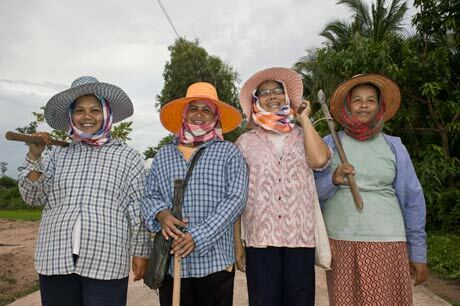 It and all of Isaan is a breath of fresh air in all senses. 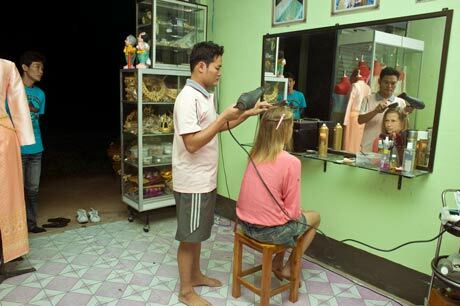 It is Thailand’s poorest and most ignored province, which means no-one speaks English, and no-one offers you banana pancakes or tourist tat. The family, after a long time persuading them that I do not want to drive around on a motorbike but by bicycle, brought me one morning an old one with no brakes, though they made me very, very happy. 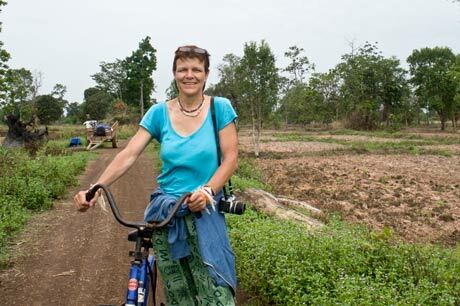 I could peddle across a vast landscape, between rice fields and stop anytime I wanted to photograph people going about their everyday business. Business as they have done for centuries: growing rice, fishing, weaving silk, catching ant larva, making brooms and charcoal and grazing cows and buffalos. 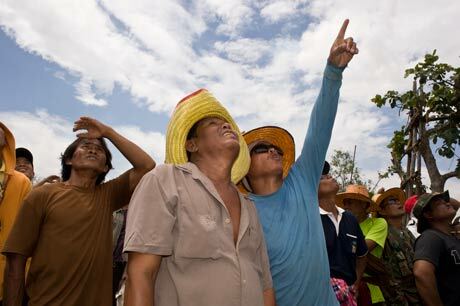 In May before the raining season farmers at the Rocket Festival launched rockets to implore the God of Rain to shower the earth with abundant rainfall for the planting season. 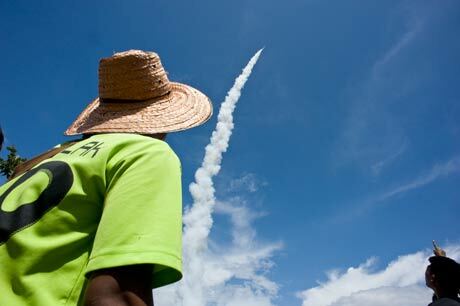 The Rocket Festival is an integral part of pastoral life as without enough rainfall crops will not grow. 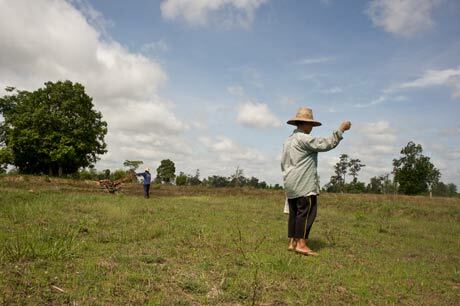 The majority of Isaan people are farmers even though the Isaan soil is poor. 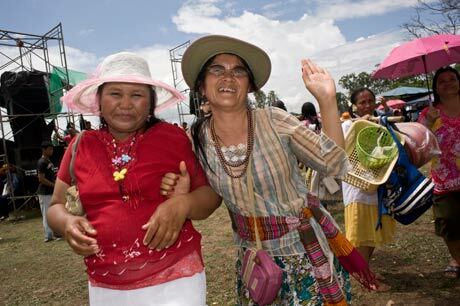 The Festival is an integral part of pastoral life. 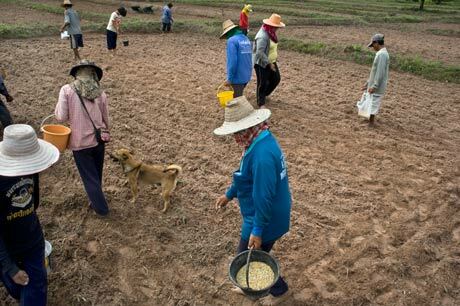 So, after all the rockets were fired into the sky and rain-making rites and other ceremonies to pray for fertility of the land were done, the rice-planting season started. 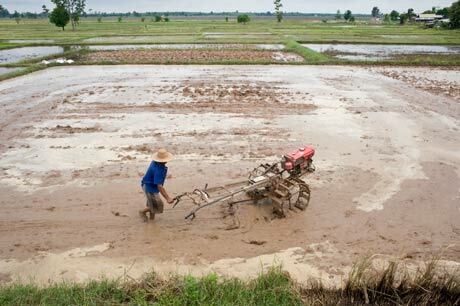 Rice seeds are planted before ploughing; then again after soil is ploughed just to be sure some rice seeds will catch on and will grow. 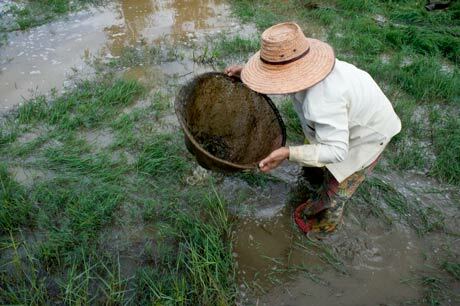 While flooding is not mandatory for cultivation of rice, all other method of irrigation require higher effort in weed and pest control during growth periods and a different approach for fertilizing the soil. 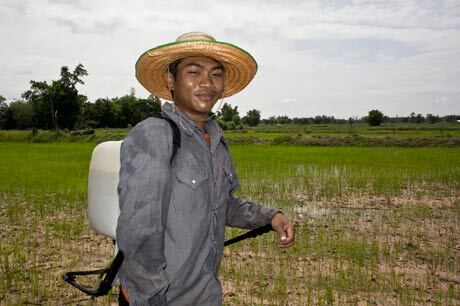 Unfortunately I could not find out what kind of chemicals these farmers use, or if it is fertilizer or weed killer. Whatever it is, it makes me always think when I ate rice (mostly 3 times a day) that chemicals are used helping rice grow. 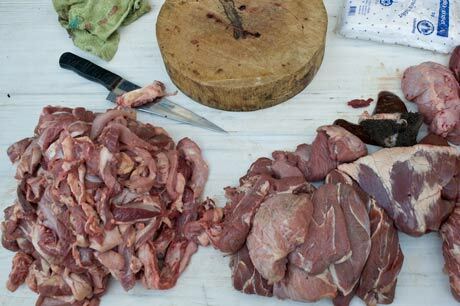 There is no distinction between the dishes eaten for breakfast, lunch and dinner. 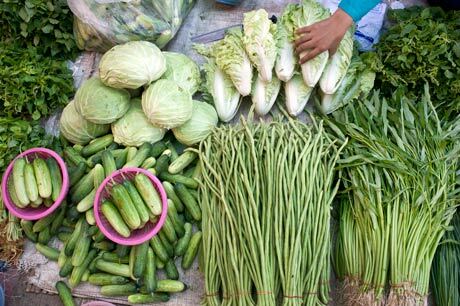 Spicy stir fried vegetables with sticky rice are just eaten in the morning as in the evening. Unfortunately I could not find out what kind of chemicals farmers use. 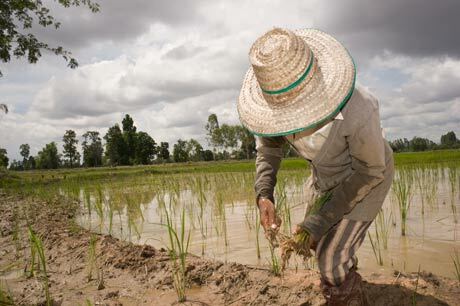 To have better quality of rice, seeds are planted at a greater distance one from the next. Rice seedlings are planted in a flooded field. 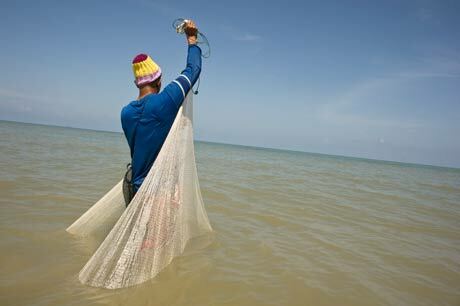 To supplement their income women often make fishnets by hand and men do all fishing. 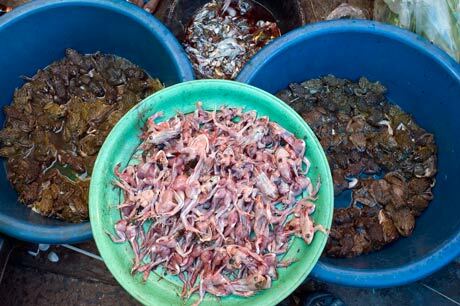 Not only fish are caught but also frogs, ant’s larva, snakes and many types of insects. 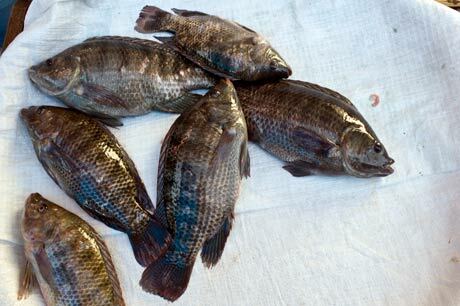 These and fish can be sold in the market or consumed by the family – the catch is an important sort of protein. A woman catching frogs in a pond. 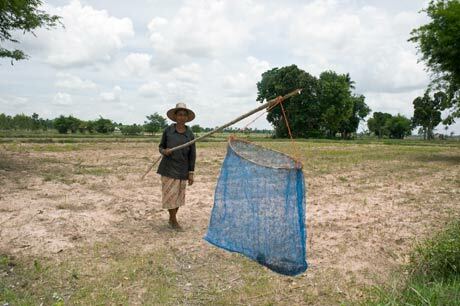 A woman with a net filled with red ants and their larva. She still has to get rid of the ants. An elderly couple collecting charcoal they made. 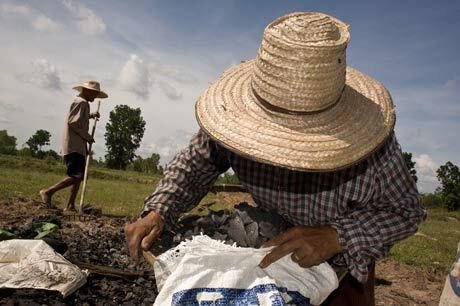 Gas is used for cooking in most towns, but villagers usually use charcoal or firewood. Euro 2012 started, but no one was interested in “my” village. 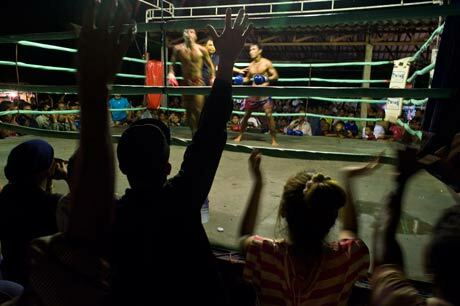 They watched on TV Muy Thai or Thai Kickboxing, Thailand’s ancient martial art. 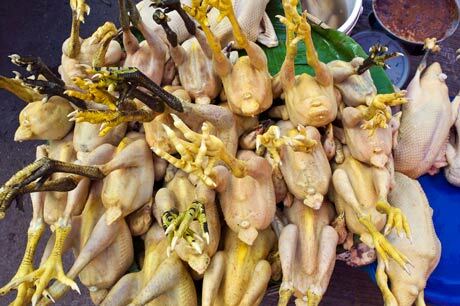 It is known as the “Art of Eight Limbs” and is the national sport of Thailand. 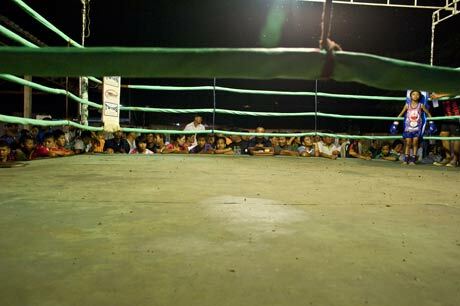 I went once to see it live, where all categories, from children to adults fought. All categories, from children to adults fought. 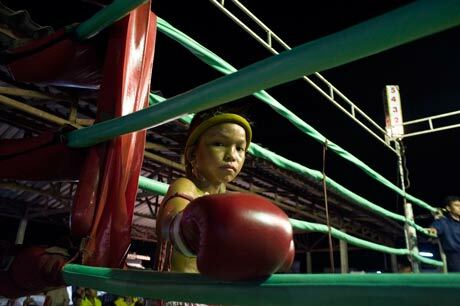 A boy uses Muay Thai fighting to feed his family. I also participating celebration of Visakha Bucha Day or the Buddha’s Birthday or Buddha Day. It isthe most holy time in the Buddhist calendar; it commemorates the birth, enlightenment and the passing away of Gautama Buddha the founder of Buddhism. Students in Kantharalak visited Buddhist Vat on Friday, three days before the D-day. They brought food and sweets for monks and they prayed. After prayers they went around the temple three times. Celebration of Visakha Bucha Day. Students in Kantharalak visited Buddhist Vat on Friday, three days before the D-day. After prayers they went around the temple three times. For the D-Day I was in Bangkok because I had to go to the Indonesian Embassy to apply for a visa. I went to Suwan Buddhist Vat where people brought gifts to Monks, where they prayed, and where they were given gifts from monk as well. Thai couple poses for a photo in Suwan Vat on the Visakha Bucha Day on June 4th. They hold baskets full of gifts to monks. Another Thai couple who already got the gifts (which they have chosen) from a monk. You must already feel my Thailand trip is at the end. I got the Indonesian visa and on June 14th I am off to Banda Aceh, Indonesia through Kuala Lumpur, Malaysia. I should still mention that I wanted to photograph buffalos, an animal that is very photogenic. But I was afraid to go closer to it, and not having a zoom but just 20mm and 28mm lenses, there is no closer shot of this magnificent animal. Most farmers use the plowing machine, which replaced buffalos. It acts as a tractor and pulls a trailer. The iron-spike wheels can be changed for tires. What else should I say. Yeah, the Isaan kitchen is much hotter than Thai kitchen. So first Isaan dishes drove tears into my eyes. When I, by accident, ate chili pepper, the family died of laughter while I was screaming like a lion into the air. 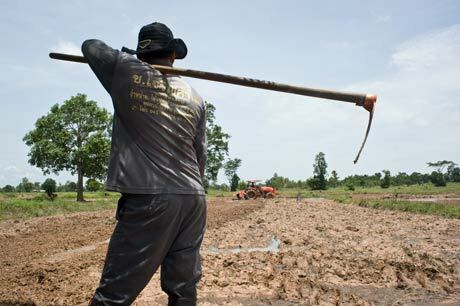 A farmer using a ploughing machine. 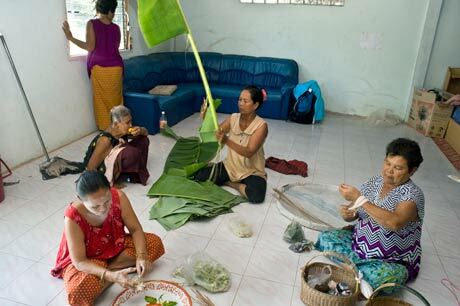 I should still mention that mostly elderly woman chew “betel” – areca nut wrapped in betel leaves, called by local’s “mak”. 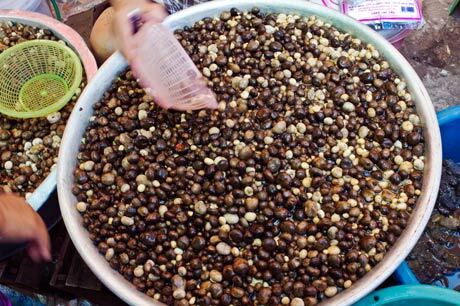 It had driven me crazy when an auntie spat her betel juice out. Red colour saliva looked like splotches of dried blood on the ground. 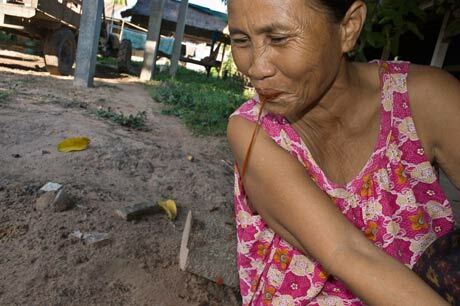 A woman spitting betel juice. 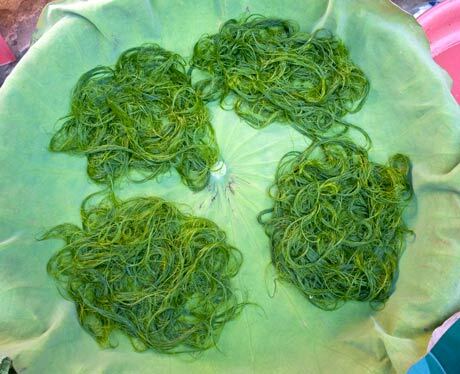 The young people find betel chewing no longer socially acceptable. 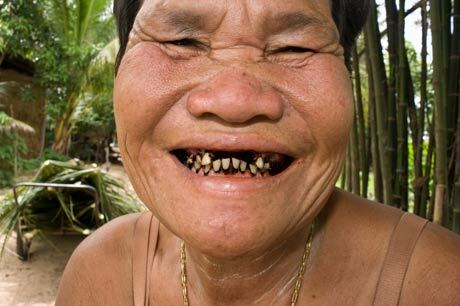 Also modern social taboos such as spitting, have contributed to the decline of betel chewing. 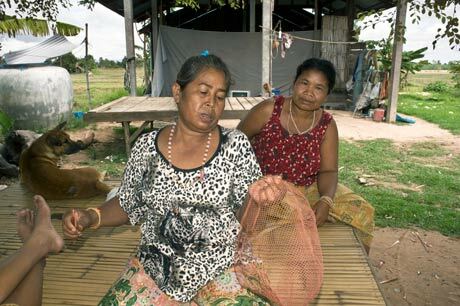 Despite a decline in the custom, the betel chewing still remains in country-side areas, where it’s use for medical and cultural purposes, and where women chew betel for social affability, in a similar way to us farangs drinking coffee together. I must say good-bye to Buddha and hello to Allah so I am off to Indonesia, the biggest Muslim population it the world. The big day started at three o’clock in the morning. We went to the hairdresser not only to get our hair done but also to be dressed in traditional wedding costumes. It was still dark outside, we were half asleep, and the corner store was still closed, so there wasn’t a beer for waking us up. Traditional very white make up was used no matter that bride is white. Corner store was still closed, so there wasn’t a beer for waking us up. When hair and make up were done, it was time for a wedding dress. And more white powder was put on arms. When everybody was done we went back home again on a pickup truck. At home wedding guests were already waiting for as and the ceremony started immediately. And then “fai” was tied on the wrists. Each “fai” must be thanked for. Food was served after the fais were all on our wrists. 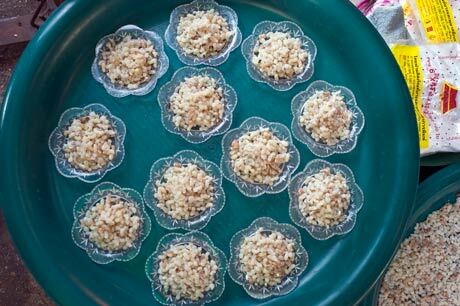 We sit on the floor, eating all Thai goodies with sticky rice. I was busy eating so there are no photographs. But I beg you to use your great imagination and picture this feast. Then the big shoot of portraits started. I brought my mobile “seamless’ and we hung it inside of house. It couldn’t be outside because that would be bad luck. The seamless was too small for all people to fit in. Then we had to rush to the car, no one understood why and where we are going, they said to fireworks. We were packed like sardines on the truck, food, beer, rum and drinking water in a container were taking up the little space we have for ourselves. We were packed like sardines. But we were all in high spirits. I found out later were we went. 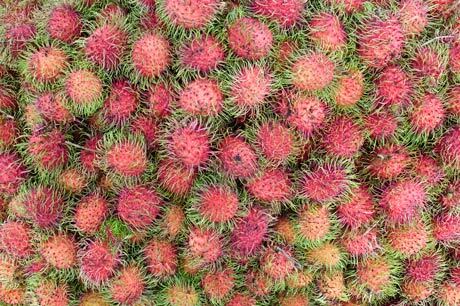 We went to Yasothon, the smallest province in the lower northeast of Isaan region. And it wasn’t for any fireworks but a Rocket Festival, which is celebrated each May at the commencement of the Rainy Season. 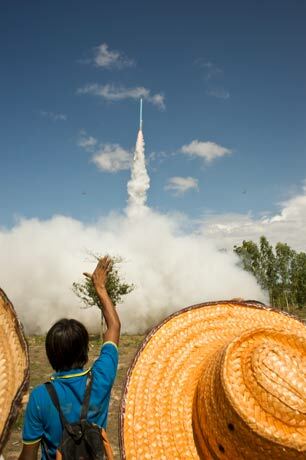 The home-made rockets were fired into the sky paying homage to the God of Rains. Everybody was drunk there; people were betting on rockets, the winner was which get the higher into sky. It was a big spectacle with dancing, screaming in excitement, talking, drinking, eating. 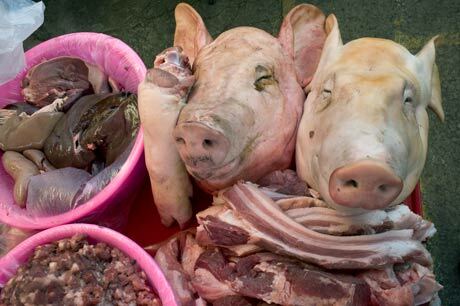 And everybody was crazy about us farangs. The home-made rocket was fired into the sky. People were betting on rockets. It was a big spectacle. Suddenly we had to leave. The family was getting worried about us, some of us were already quite drunk so they decided it’s time to go home, and continue to celebrate the wedding. And how did the wedding end? With a dance to Thai and Czech music. Back in Bangkok, just for couple hours before we are off by train to Isaan – the northeastern region of Thailand. We got off in Si Sa Ket, then continue to Kantharalak by bus. In Kantharalak one of the groom’s family members was waiting for us with a track. 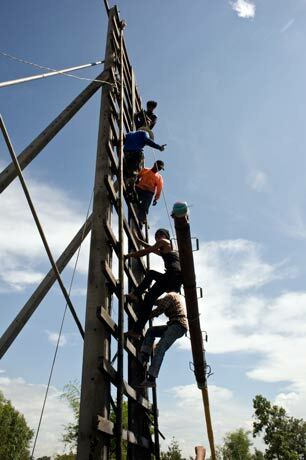 We had still 30 km to go to the village of Nong Diang Noi Non Yai. There are 2 days left before the wedding. Not much is happening; no kind of preparation – no food is cooked, no decoration is done, everything, most of it will all be done the day before the big day. So we relax, drink beer, local rice “vodka” and Sang Som, a local rum­­­­­­­­­­­­­­. A day before the wedding women started to make a Buddhist POT. Leaves of banana are cut, small flowers are added. And then all this is ensemble together. The bride and groom with two witnesses and farangs (Thai word for someone of European ancestry, no matter where they may come from) went to the authority’s office, where the marriage was officially signed. Marriage is officially signed – first bride. and now Martina and Jet are officially married. After the official wedding, we went to the market to buy food for the wedding, in the back of a pickup truck, the way everybody travels in Thailand. Going to the market in the back of a pickup truck. 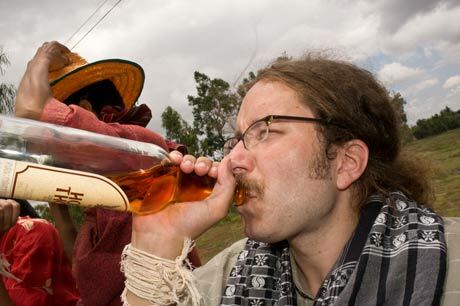 I should not forget alcohol – beers, local rice “vodka’” and rum were bought as well. All this was put on the truck, between us. Chang beer for the wedding. For the family, kitschy pictures of Prague were printed and framed. We wanted to sleep early because the big day started the next day in the early hours. But cooking went on; villagers were visiting or just were coming to see so many farangs in one place at the same time, a rare occasion. I went to Thailand to photograph the wedding of my friend Martina. I didn’t go alone but with other friends of her’s. The wedding was scheduled on May 19, 2012 but we arrived in Bangkok two weeks earlier. We were five but only four were staying for the wedding. We didn’t fly to Bangkok together; everybody was coming with different air companies and by different routes and times. Do not ask me why. It just happened this way. I was flying with AeroSvit Ukrainian Airlines (which I would not recommend to anyone), arriving at Bangkok airport at three o’clock in the morning. Peter was arriving the same day but four hours later and I should wait for him. So I was wandering across the airport, I bought couple beers, but time didn’t move. I bought more beers till my eyelids were getting heavier and heavier and eventually they just shut down and I couldn’t open them anymore. Peter arrived, the future bride came to meet us, they looked for me but I was nowhere to be found – I was sleeping heavily in a far corner with other travelers, homeless and airport workers. Luckily, my angel woke me up and I rushed to look for my friends, worried that they may have left the airport without me. They did not. We found a cheap hotel, one room for all, with one double bed, some will have to sleep on the floor. The future bride and groom introduced us to their Thai friends and a beer marathon started and it lasted for three days. What else to do in Bangkok, where the temperature and humidity are very high. Jet, the future groom, works at an ice distribution centre. In this heat ice cubes are in high demand, employees work from early morning to late night. Thailand is a tropical country with sunshine and high temperature all year long, so ice is very necessary for its people. 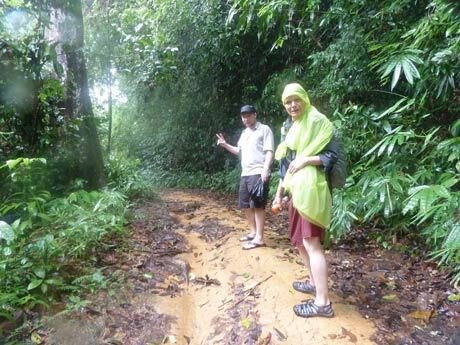 When everybody arrived in Bangkok we jumped on the train and then a bus and finally arrived to Khao Sok – rainforest resort. 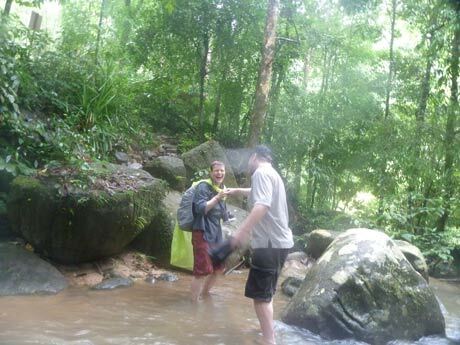 In the tourist guide it’s written, “more than 48 species of mammals, 184 species of birds and thousands of species of trees and plants have been recorded there.” We went to see waterfalls where on the footpaths leeches were waiting for us. And there were millions of them. The waterfall was a kind of rapid or maybe we just didn’t get to the right one. There was frogs’ music during the night and one burglar, who checked some backpacks and took only local money. I guess he was a Buddhist thief. From Khao Sok we moved to Koh Lanta. We travel all day, changing one bus after another, then minibus to ferry, exiting at the beach for a swim. Well…when we arrived we find not a sandy beach but a coral one…it was ebb tide. We find not a sandy beach but a coral one. A portrait of a sea gypsy in the village of Sang-ga-u in the south east corner of Koh Lanta. Sea Gypsies or “Chao Ley” (people of the sea) used to live a semi-nomadic lifestyle in the Andaman Sea; these seafarers of Indo-Malay origins were also the first settlers on the island some 500 years ago. 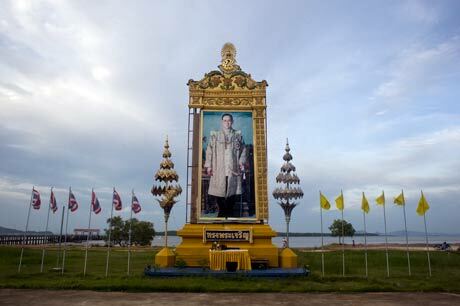 A picture of the Rama IX, the current King of Thailand in the old town of Lanta Old Town. 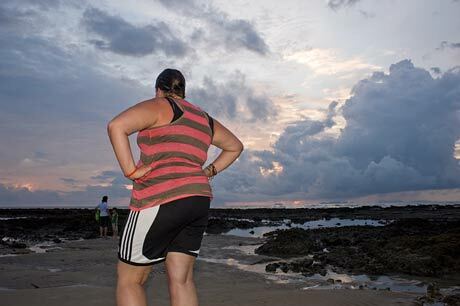 I wished I could stay longer in this small Koh Lanta Island and become a friend of the sea gypsies. 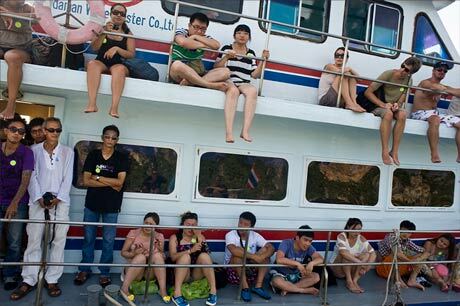 But we were on move again, this time to a really touristic area – Phi Phi Island. We travelled by boat with all the tourists, meeting another boats full of tourists as well. A boat full of tourists. Phi Phi village is very, very, touristic. We had bungalows far from the center, though the music was so loud all night – ok, it finished at 3:00 a.m. – there were some seriously stupid show, the same each night and the same music as well. Ah, Phi Phi Island, I did not like you and I was wasting the little money I had on you. Some Thai come every morning to work here. We took a boat trip to other islands. The first stop was on the Monkey Island. 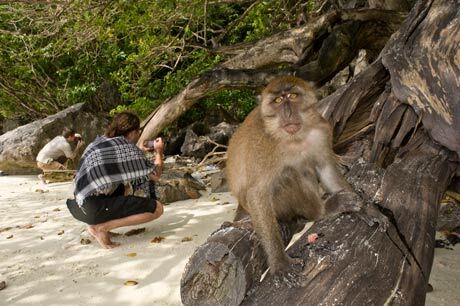 Monkeys were supposed to be friendly to human tourists. But with our group they were not friendly at all. Well, in the beginning it looked like they might like us. But then one jumped on me… and other one grappled Peta’s hair…and it wasn’t funny anymore. 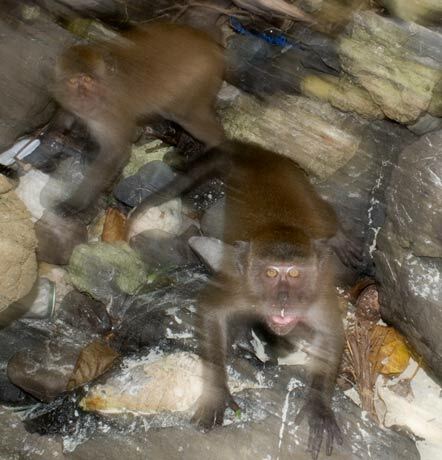 Crazy monkeys ready to jump on me. 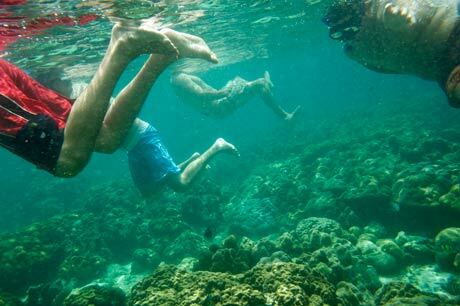 The next stop was ….boy do not know the name but I felt whole of the world is snorkeling there. 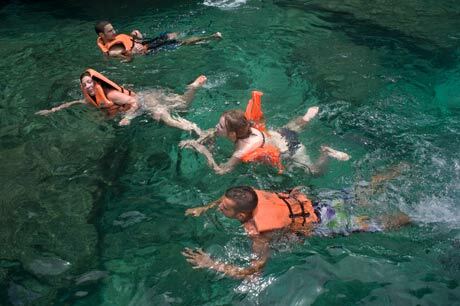 Whole of the world is snorkeling there. 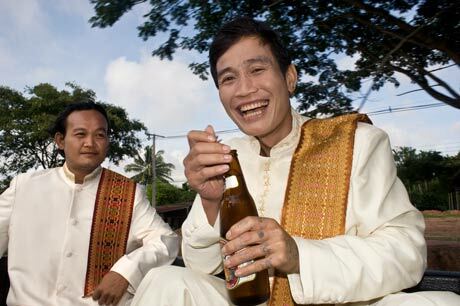 I must say I was very happy to go back to Bangkok, from where we were going to Isaan….the wedding. New protests kicked off the year 2011. The statue of Josef Stalin was blown up on New Year’s Eve in Zaporizha (western Ukraine). 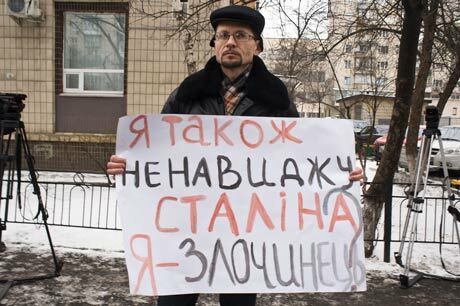 On January 14, a protest was held at the Presidential Administration building against recent arrests of mem-bers of nationalist groups who claimed responsibility for decapitating the bust of Josef Stalin in Zaporizha on December 28, 2010. On January 17, citizens took to the streets to prevent the government from shifting the tax burden to small and medium-sized businesses. New protests kicked off the year 2011. Yanukovich was promising a five-year tax holiday for small businesses during the 2010 presidential election campaign and one year later, he’s accusing small business owners of trying to avoid paying taxes. Furthermore, he promised to respect laws but rolled back media freedoms, banned peaceful protests and is said to have fixed the nationwide local elections. Citizens took to the streets to prevent the government from shifting the tax burden to small and medium-sized businesses. 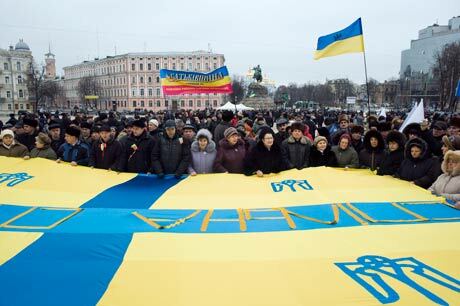 The events of Unity Day (Den Sobornosti) on January 22 have revealed how divided Ukraine is. 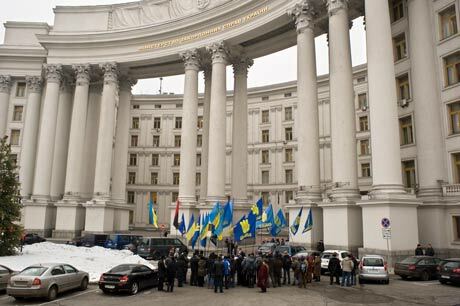 The Kyiv City Administration received 20 applications for holding different rallies in Kyiv on that day. Civic leaders and Yulia Tymoshenko, for example, called on citizens to gather on Kyiv’s St. Sophia Square to support demands for early parliamentary elections. 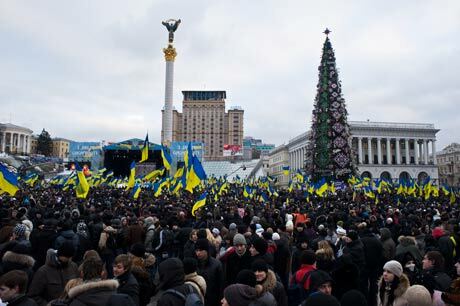 Yanukovich and his allies organized an all-day concert on Maidan Nezalezhnosti (Independence Square) where attendees were paid 120 Hryvnas to be there. But many people for some reason were not paid the bribe, so they stormed one of the Ukraine’s Regions Party offices and demanded their money. It is really the terrible poverty that makes people to stay and hold the Ukrainian flag – they can earn 120 Hryvnas ($15) for standing seven hours on Maidan Nezalezhnosti. Celebration of the Unity Day on Maidan Nezalezhnosti (Independence Square). Attendees were paid 120 Hryvnas. I spent most of the time at Tymoshenko’s rally where speeches were delivered, where folklore music and theater were played, where newspapers and pamphlets were given away and where Tymoshenko demanded parliamentary elections to be held this year or else a peaceful revolution will topple the president and his government. 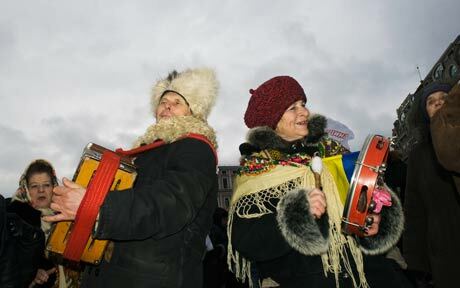 Folklore music and theater were played during the Ukrainian national holiday of Unity Day. Followers of former Prime Minister Yulia Tymoshenko gather together on Kiev’s St. Sophia Square to celebrate Unity Day on January 22. It was on this day in 1919 that the Ukrainian National Republic united with Western Ukrainian National Republic to form a short-lived state. 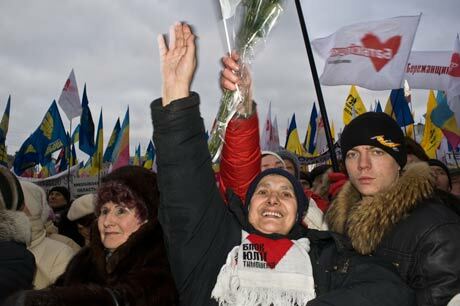 Supporters of Julia Tymoshenko applauding to former prime minister Yulia Tymoshenko’s speech. Moscow police have closed the only Ukrainian library in Russia, confident that now it can do so without objections from the Yanukovich government in Kyiv. Like the Soviet predecessor, the Russian government has never been supportive of the more than five million ethnic Ukrainians living in Russia, refusing to open any Ukrainian-language state schools even as it has complained about the closure of some of the many Russian-language schools operating in Ukraine. A small number of citizens demonstrated in front of the Ministry of Foreign Affairs against the library closure. A small number of citizens demonstrated in front of the Ministry of Foreign Affairs against the library closure. Did you close the Ukrainian Library? We will close Russian schools! 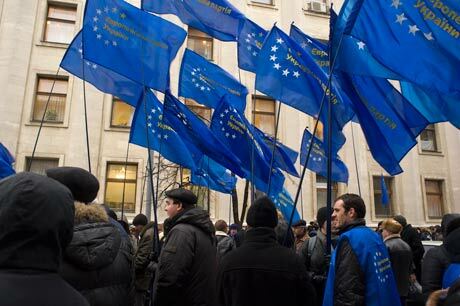 On January 27, a demonstration against political repressions was held by one of the grassroots organizations, the Tryzup (Trident – a Ukraine-wide nationalist organization) in front of the Ukrainian Federal Prosecutor’s Office in Kyiv. Seven activists of the Tryzub were arrested for beheading the bust of Stalin on December 28, 2010. Later on, more members of Tryzub were detained. I do not like Stalin either. Am I a criminal? 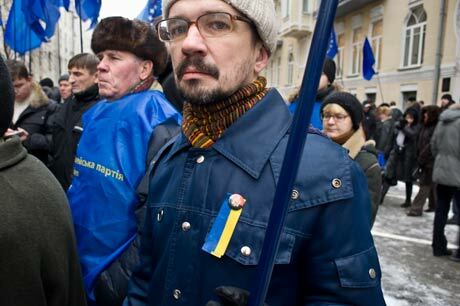 The Kruty Heroes’ Remembrance Day on Jan. 29 has shown how Ukrainian the opposition groups are divided as well. First, in the morning of that day Julia Tymoshenko and her supporters laid flowers honoring all of those killed at the Askold’s Grave in Kyiv. 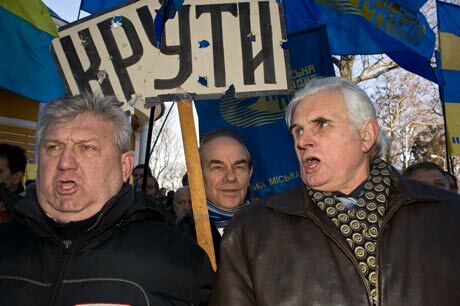 Later, the Ukrainian People’s Party with The Tryzub (All-Ukrainian Association) did the same. Why they didn’t do it together, only they know. Who are the Kruty heroes? It all happened 93 years ago (January 29, 1918), when students fought the Bolsheviks, defending the Ukrainian People’s Republic near the village of Kruty where all of them were killed. Throughout the years, the true story of the battle was hidden from the view by the Soviet Government. Even today, Vladimir Putin the Russian Prime Minister is not happy about the Kruty Heroes Remembrance Day. 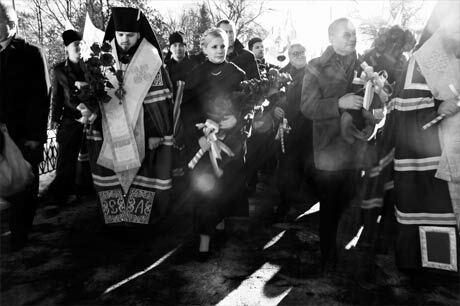 Former prime minister Yulia Tymoshenko and her supporters laid flowers honoring Kruty heroes. Remembering the Kruty Heroes, Kyiv. Tymoshenko’s investigation continues and journalists and a small number of supporters always wait for her in front of the Prosecutor General’s Office no matter if it is snowing, freezing or raining. 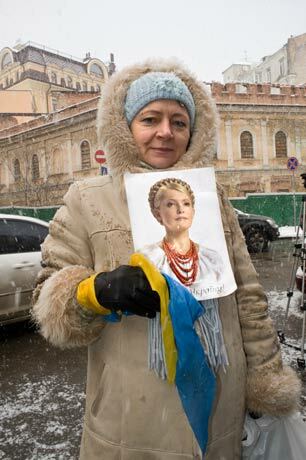 A supporter of Yulia Tymoshenko, former Prime Minister, holds a photograph ofTymoshenko in front of the Prosecutor Generals Office on January 18. Prosecutors launched criminal cases against Tymoshenko, accusing her of abuse of power by misspending government money when she was in power. Opposition leader Yulia Tymoshenko is surrounded by journalists and supporters in downtown Kiev on January 25, 2011 before being questioned by investigators. Mrs. Tymoshenko stands accused of misspending some $280 million in state funds while serving as prime minister in 2009. Tymoshenko denies all wrongdoing. Ukraine has a long way to go. And it will not be easy. Democracy remained elusive, the global corruption survey shows that Ukraine has the highest level of corruption among the Newly Independent States. 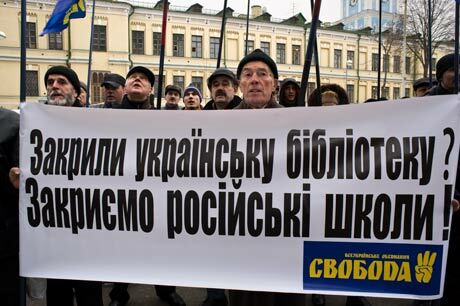 The Russian language and culture dominates in many parts of Ukraine (many, like Prime Minister Putin do not think it is a real nation); and there is no abiding law and order. Ukraine has been carved up and suffered the two biggest tyrants known to mankind – Hitler and Stalin – and the paradox is that an explosion which destroyed a bust of the Stalin on 31 December 2010 is classified as an act of terrorism, instead of vandalism! Millions of Ukrainians have been murdered in war and forced famines. 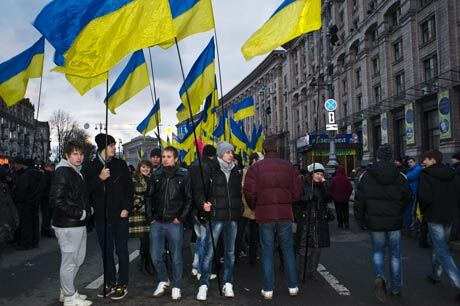 Two decades into its existence, Ukrainian still struggle for survival and nationhood.